Southern Illinois University Edwardsville School of Engineering (SOE) Dean Cem Karacal, PhD, welcomed a contingent from Tongmyong University (TU) of Busan, South Korea on Monday, Dec. 4, the first of the group’s three-day visit to the SIUE campus. Among the Korean visitors was TU’s School of Engineering Dean Kim Jung-In. Karacal stressed the value of the growing and important partnership between the two schools. This week’s trip was the fourth trip for TU visitors to SIUE. A partnership between the institutions began in 2014, when a formal agreement was made to offer a 2+2 dual diploma program between TU and the SIUE School of Engineering. During the question and answer portion, one TU female student wanted to know a point of pride for the SIUE and the SOE. Later that day, several TU students presented projects during the final presentation class of H. Felix Lee, PhD, professor in the Department of Mechanical and Industrial Engineering. (L-R) Visiting from Tongmyong University (TU) of Busan, South Korea: Kee Joo Kim, PhD, professor in the Department of Mechatronics Engineering and head of the Center of CK-1 Mechanics Plant Office; Kim Hong, PhD, general manager, Head Office for Government Funds Administration Team Leader, CK Administration Team; Cem Karacal, PhD, SIUE School of Engineering dean; Soondo Kweon, PhD, SOE assistant professor; Kim Jung-In, PhD, TU School of Engineering dean and professor in the Department of Computer Engineering; and Soo-Lyong Lee, PhD, professor in the College of Engineering, School of Naval Architecture and Ocean Engineering. Students from Dongmyoung University, were part of the delegation from TU. 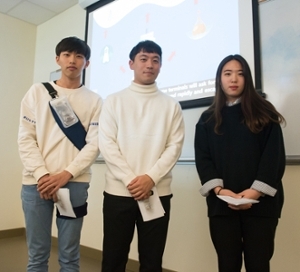 Presenting their engineering project in Dr. H. Felix Lee’s SIUE Department of Mechanical and Industrial Engineering class were (left to right): Yoon Hae Seong, Han Sang Pil and Jung Hyunkyoung.